Lately, ESPN has been playing a show where I went for bracelet No. 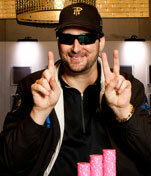 12 on a final table at the World Series of Poker (WSOP). While watching the broadcast, a couple of things came to mind. First, I should have folded the hand that I went broke on. Second, some subtle things happened during a spectacular hand that should have changed the course of the tournament. With the blinds at $15,000 to $30,000 and a $4,000-per-person ante, Player A opened for $90,000 in early position. Player Beth Shak raised, and proceeded to count out the $90,000 and throw it into the pot. Then she waited about 10 seconds and said “all-in,” and pushed in the rest of her chips. I quickly, and I mean within a quarter of a second after she pushed, announced “all-in!” I had $130,000 or so. A few seconds after I jumped out of my seat moving all-in, Shak started dancing with joy. She even said — to her husband in the stands — “I got it!” The action was back on Player A, who studied for about 25 seconds before he called $280,000 (all of his chips with K-K). Shak flipped up A-A, I flipped up A-A, and Player A flipped up K-K. I have never seen A-A, A-A and K-K all out there in the same hand before. Shak and I went on to split the pot, and Player A was eliminated. Still, in all three cases of Shak moving all-in listed above, she pushed all of her chips in at once. This time, she threw in the call first, and then, after 20 seconds, she moved all-in. This was clue No. 1, but by itself it was not enough for Player A to fold K-K.
Clue No. 2 is much more obvious. I moved all-in within a quarter of a second, for the third raise, after playing super-patient poker. Everyone had to know that I had A-A — or K-K at the worst. Also, I made it easy for them to know that I had A-A by the speed of my moving all-in and the “insta-call” motion (I pushed the chips in so fast that they fell over) that I’m famous for when I have the best possible hand. In fact, I was sending a message of strength because I didn’t want Player A to call. You see, Player A had bet $90,000, and Shak had already moved all-in, so I could win an extra $40,000 only if Player A called, but I risked losing the whole pot. My actions, and the fact that I played the pot for the third raise, should have told Player A that I had A-A. The third and fourth clues are related to Shak. The third clue was that Shak was dancing — actually dancing with joy at the prospect of busting me, and with the excitement of someone who is about to win a huge pot. There was no trepidation in her at all: someone holding K-K would have some trepidation! The most obvious clue was the fourth clue. Shak told her husband, “I got it.” Her husband was even telling the crowd around him that she had A-A. A) Look into someone else’s soul!